for about six months now, i have loosely committed myself to reading biographies about artists, particularly women artists. this commitment is not one that started intentionally, it has merely become a serendipitous trend over the past several months, and i'm going with it. more something that i've stumbled upon, that i am really loving. it started with frida kahlo, whose bio i devoured in december and january (or thereabouts). 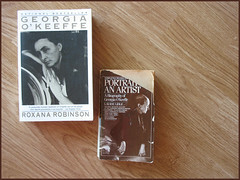 now, due to some chance finds at local san francisco thrift stores, i have moved on to georgia o' keeffe. they have a clear and nearly unwavering commitment to their own personal aesthetic vision, and to the way they want to live their lives. they have strong opinions about politics, art, and personal expression. but what really excites me (from a fashion perspective) about these two women (and perhaps more women (or men!) artists i've yet to read about!) 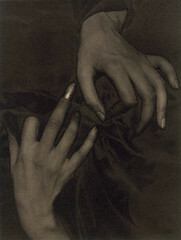 is this: in the case of both o' keeffe, and kahlo, there is a direct and strong connection between the art that they make, and how they express themselves through their personal being and personal style. i wrote about kahlo and the artful way she dressed herself here. but i want to now turn to o'keeffe, whose simultaneously lush and passionate though controlled and ascetic style is evident even in her everyday attire. For years Georgia had stitched most of her simple clothes out of the finest fabric, often sewing when she wanted to think. She made luxurious white silk blouses, white cotton nightgowns with white embroidery, and petticoats edged with white lace. In cold weather she donned a black wool coat with a collar that buttoned up to her chin and black gloves of the best leather. At one time, she sported a pair of black bloomers under a tentlike black tunic. Throughout the years, when asked the reason for her monotone clothing -odd for a painter- she gave several, all with some truth to them. Once she said that if she began to choose colors to wear, she would not have time to pick any to paint. Another time she explained that she was so sensitive to color that if she wore a red dress, she would be obliged to live up to its flamboyance. She claimed she liked being cloaked in anonymity. "There's something about black," she remarked. "You feel hidden away in it." Deadly-serious black also served to transmit the message that she was not to be treated frivolously or flirtatiously. Also, she must have realized that if her clothes were one color, they would match and she would achieve a look of maximum elegance with a minimum of time and money. 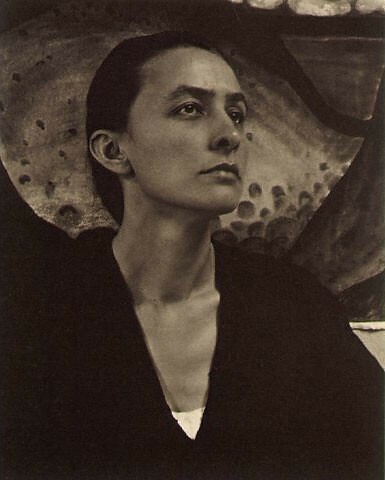 O' Keeffe was a woman painter in an early-twentieth century modern art world that was undeniably dominated by men. In order to be taken seriously in this context, it seems to me that she embraced her propensity to be sort of masculine and strong through what she wore: what was primarily a wardrobe of black and white, luxurious but spare clothing. Over time, her hair was also worn in a very spare, even severe style, pulled back straight from her forehead. She wore little to no makeup, and plucked nary a hair. She unapologetically faced the world as she was, standing tall. Some even compared her to a nun. This front she created was significant and in marked contrast to what most other women in the late 19th and early 20th century donned: ladies of the day throughout many of a decade often wore vividly bright and flamboyant colors and patterns, depending on the fashion at the time. 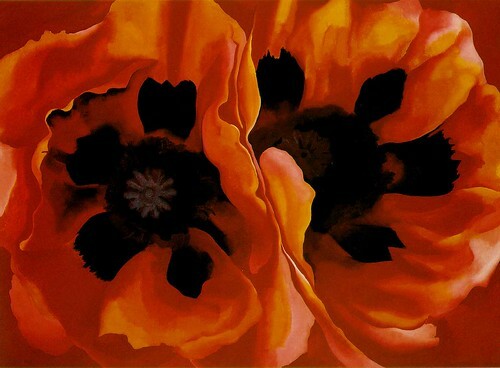 O' Keeffe wanted to set herself apart, wanted to appear almost mannish, wanted to lessen the importance of her clothing and let her powerful, colorful work take center stage. however, it seems clear that in not wanting to indulge the fashion of the day, she embraced a particular, idiosyncratic personal style that she actually worked very hard to maintain, for most of the rest of her life. She cared greatly about how she would be perceived in the world at large and fashioned a look that reflected her persona and how she chose to make her art, but at the same time, never really conceded to the fashion trends of any of the decades she lived through (and they were many...she lived to her 90s!). she always stood steadfastly, even defiantly apart from the crowd, and did not mind that one bit. next up on my reading list of women artists? this tome about coco chanel.